Just as he was during his tenure as the team’s pitching coach, Mel Stottlemyre was under- appreciated as a Yankee starting pitcher. He did the bulk of his hurling during one of the bleakest ten-year periods in Pinstripe history. Yet he finished his career with a 2.97 ERA, 40 shutouts and averaged 16 victories per season. 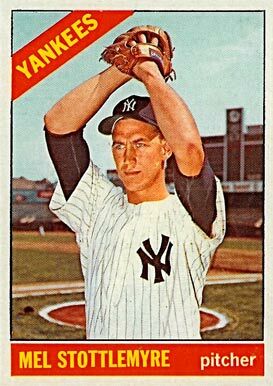 Born in Hazelton, MO in 1941, Stottlemyre became one of my favorite players when the Yankees brought him up from the minors at the 1964 mid season and he won nine of twelve decisions to help the team come from behind and win the pennant. He then pitched two great games against the Cardinals in that season’s Fall Classic. I still remember watching the final game of that Series when Yankee Manager,Yogi Berra gave the 22-year-old right-hander the starting assignment a third time on just two-days rest because Whitey Ford couldn’t lift his left arm. Mel gave up three runs in the fourth inning on a walk and a bunch of singles. Berra’s decision to replace Stottlemyre with Al Downing an inning later immediately backfired when Downing gave up a lead-off home run to Lou Brock and a couple of more hits and the Cardinals scored three more runs. That negated the impact of Mickey Mantle’s three-run blast the following inning. The Yankees and Stottlemyre lost the game, Berra lost his job and my favorite team didn’t get back to a World Series for the next 11 years. My anti-Yankee friends like to point out that Stottlemyre did almost all of his pitching before the American League implemented the designated hitter rule in 1973. This, they contend, explains why his ERA and shutout numbers are much more impressive than today’s starting pitchers. Not so fast. Stottlemyre’s record during the 1973 season, his only full year pitching to a DH, shows 16 victories, 4 shutouts, and an ERA of 3.07 for a Yankee team that had the third worst rated offense in the league that season. In fact, if it were not for a rotator cuff injury that ended his career at the age of 32, in 1974, I believe Stottlemyre would have remained an effective sinker-balling starter for the great Yankee teams of the mid-seventies. In the process, he might have won a World Series, close to fifty more career victories and had his uniform number retired. Besides pitching, the other thing Mel did very well was help others become better pitchers. Both his sons ended up pitching in the big leagues and Mel was the pitching coach for both the 1986 World Champion Mets and the four Joe Torre-led World Champion Yankee teams. Not a bad hitter either. I remember he once had an inside-the-park grand slam at the old Yankee Stadium — a line drive that rolled out to the monuments in deep center field.